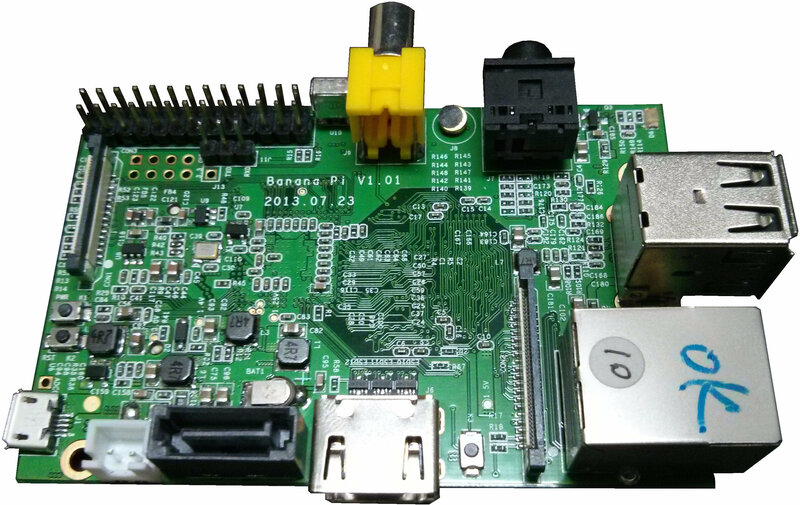 The Banana Pi (also known as Banana Pi M1) is trying very hard to mimic the formfactor of the Raspberry Pi and to cash in on its popularity, but it fails to match both the exterior dimensions, the exact connector placing and the software support. Despite manufacturer claims of being open source, this is not open source hardware. If you are thinking of getting this device, you should also try looking into the hardware from our Community instead. There is also little actual support to be had from LeMaker (and even less from SinoVoip), mostly they are just rehashing things from the linux sunxi community. The Banana Pi has clearly suffered from having different manufacturers/distributors each favor their competing model variants and create their own (sub)"communities". On top of that there were clashes and legal disputes over trademarks and domain ownership. Quite often it would be unclear who's officially responsible for a particular device, and what degree of support the vendor provided. This has created confusion among users, and contradicted the collaborative approach that could be expected from the "open (source)" marketing label they unanimously used. In 2015-11 the person behind Xunlong (Orange Pi) claimed he was paid to do the ODM work for Banana Pi in the beginning. Current mainline U-Boot (v2015.04) and mainline kernel (3.19.2+) work well on the Banana Pi. Kernel 4.0+ is recommended, as it adds cpufreq support for A20 SoCs (allowing lower power consumption and reduced temperatures). For building U-Boot, use the Bananapi target (make Bananapi_defconfig). Note: Banana Pi's GMAC is not supported in the community ("sunxi-3.4") kernel. If you want proper gigabit networking support, you'll either have to use one of the later kernels diverged from the 3.4.x line (e.g. the ones from LeMaker, Igor Pečovnik or Daniel Andersen), or a 4.1+ mainline kernel - in combination with a suitable U-Boot version (v2015.04 and up). Using legacy u-boot-sunxi is now deprecated / mostly obsolete for the Banana Pi. As of mid-2015 you should prefer mainline U-Boot 2015.04 - which offers a wide range of features, including networking and netconsole. Mainline U-Boot also supports booting older 3.4.x kernels. If booting your 3.4.x kernel fails with "Error: unrecognized/unsupported machine ID", you need to adjust your U-Boot config or patch the kernel - see troubleshooting. In case it completely refuses to boot / gets stuck right after "booting the kernel", make sure that bootm_boot_mode=sec is set. Use the sun7i-a20-bananapi.dtb device-tree file, and follow the Mainline Kernel Howto. The Banana Pi has a 26-pin, 0.1" connector with several low-speed interfaces. The Banana Pi also has two sets of extra GPIO pins (2x4 pins and 1x2 pins) next to the 26 pin connector. If no SD card is present, the A20 will automatically fall back to FEL mode (as this device has no other means of booting, like e.g. onboard NAND flash). So if you want to enforce FEL mode, you may simply remove the SD card and connect to the Banana Pi via the OTG micro USB (the one right next to the SD slot). This also supplies power to the board at the same time. The blue LED (D6) is coupled to the Ethernet PHY, and only able to indicate network-related activity. A small utility named bpi_ledset can control it (together with the other LEDs directly on the network connector). As another improvement BananaLEDd has been written to show disk activity or average load with the blue LED (starting with v1.2 also supporting LEDs through sysfs). The green LED (D8) is GPIO-driven via PH24, and thus user-definable. It usually can be controlled by writing to the special file /sys/class/leds/bananapi:green:usr/trigger (requires root privileges). Some configurations set the green LED function to "heartbeat" by default, causing it to flash constantly - "none" will turn it off instead. (Check the output of cat /sys/class/leds/bananapi:green:usr/trigger for possible values.) Note: Older kernels (3.4.x) may name the file /sys/class/leds/green:ph24:led1/trigger instead. If you wish to connect a SATA drive (2.5" mobile harddisk or SSD) to the Banana Pi: Make sure your power supply is connected to the "DC-IN" port (micro USB next to the SATA connector), and can deliver sufficient current (e.g. 5V/2000mA). Using the OTG port or an inadequate power supply might result in your SATA device not being detected. In case you're using large SATA drives > 2TB, you might want to check that both your U-Boot and kernel support proper LBA48 addressing and partioning schemes (GPT). For U-Boot, make sure that CONFIG_SYS_64BIT_LBA gets defined (as of 2015.04 it's not in the default configuration). For kernel configuration, see this FAQ entry. The Banana Pi features a standard 3-pin onboard infrared receiver (AX-1838HS or comparable type), which is connected straight to the A20's IR0_RX pin (PB4). The Linux kernel supports this receiver via CONFIG_IR_SUNXI. The mainline kernel option is located under "Device drivers", "Multimedia support", "Remote Controller devices", "SUNXI IR remote control"; the driver is named sunxi_cir. For 3.4.x kernels, use "Device drivers", "Input device support", "Keyboards", "sunxi IR support"; the module name is sunxi-ir. For tips on how to setup and configure LIRC, see this description for Cubieboard2. The SATA power connector (J5) and the normal power-in micro USB connector (located between SATA and SATA-pwr) are directly wired with each other (with a ferrite bead FB3 in between responsible for some voltage drops). So when no 2.5" SATA disk is used, the board can also be powered alternatively through this connector. This might work more reliably, since many USB cables suffer from voltage drops due to the tiny connectors the Micro USB port dictates (max. 5 V / 1.8 A according to the USB specs) or insufficient cable diameters. To build the SATA power connector you have to buy a connector housing and two crimp contacts from the JST XH 2.5mm series. In some shops these are sold as "JST 800055" and "JST 800138", respectively. There are two unpopulated connectors: BAT for external battery (with + marked nearby), BAT1 for RTC battery ( http://forum.lemaker.org/forum.php?mod=viewthread&tid=291&extra=page%3D1&page=1 ). Some users have been reporting hardware defects due to loss of VCC-5V, e.g. failure to power the USB (host) ports etc. Frequently this is related to a "D5 diode problem". The Banana Pi schematic lists this part (1N5819, SO-123) in the "VCC-5V" section, showing it feeds the VCC-5V line from the AXP209's IPSOUT. If you suspect a problem with D5, check the test points: if IPSOUT is okay and 5.0V absent, then D5 likely is the culprit. It might have blown, e.g. due to drawing too much current or using a "bad" USB hub that backpowered the Pi (when self-powered). Apparently there was even a batch of devices - first 1000 according to SinoVoip - where D5 was actually dimensioned too small. Banana Pi LCDs are described in a separate page. While the GPIO pinout of the Banana Pi is designed to be compatible to the Raspberry Pi, it's important to notice subtle differences in the serial ports. The Banana Pi has some additional pins that already provide two more serial ports. The default serial port /dev/ttyS0 at MMIO 0x1c28000, used for (bootstrap) debugging and the serial console, is located at J11 - refer to the picture and instructions below. The Raspberry's "original" serial port on GPIO 14 and 15 (CON3, pins 8 and 10 - at MMIO 0x1c28c00) can usually be accessed as /dev/ttyS2 on the Banana Pi. J12 also provides another serial port on pins 4 (RXD) and 6 (TXD) at MMIO 0x1c29c00, which should map to /dev/ttyS3. The mainline kernel likely just numbers the three ports listed above sequentially: /dev/ttyS[0-2]. They get defined in the device tree (.dtb file). The UART pins (UART3) are located in the upper left corner of the board. They are marked as TXD, RXD and GND on the PCB. TXD and RXD are on J11, GND can be grabbed from pin 7 or 8 of J12. Just attach some leads according to our UART Howto. Do not connect the red wire (VCC or 3.3 V / 5 V), as that might damage your board. The original Banana Pi went into mass production in March 2014 (PCB revision 1.4). SinoVoip now labels it BPi-M1 ("model 1") to distinguish it from other models that were introduced later. The M1 features a standard SD card slot and a 26 pin GPIO connector (similar to the Raspberry Pi A/B). Foxconn also produced a Banana Pi variant called the "Super Pi". It has a different PCB layout and different positions for onboard connectors, but preliminary tests show that it's (mostly?) compatible with the Banana Pi. The LeMaker Banana Pro was presented in October 2014. It's an updated version of M1, using a microSD slot, onboard WiFi (AP6181) and a 40 pin GPIO header (that mimics the Raspberry Pi A+/B+ models). SinoVoip produced a different version called "M1Plus" (BPi-M1+) as a Banana Pro rip-off sharing exactly the same hardware specs and almost the same position of onboard connectors. Main difference: SoC, DRAM and PMU are on the upper side of the PCB whereas on the lower on Banana Pro. Featurewise both boards are nearly identical and fex/dts files can be interchanged directly, with one small exception: according to LeMaker's and Sinovoip's fex files, [audio_pa_ctrl] differs: PH26 on M1+ and PH15 on Banana Pro. It turned also out that the blue led is red and connected to PH25 instead of PG02. 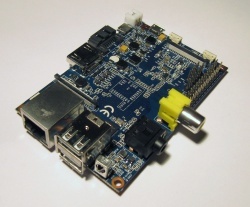 The Banana Pi Router (BPi-R1 also known as Lamobo R1) uses a larger form factor. The board has microSD, onboard WiFi (RTL8192CU), 5 Gbit Ethernet ports, 26 pin GPIO compatible to BPi/M1 and a connector to directly attach a SATA drive. The Banana Pi M2 (BPi-M2, "model 2") is announced for 2015 (shipping from April). It offers microSD, onboard WiFi (AP6181, 802.11b/g/n), 40 pin GPIO and 4 USB type A connectors. However this device has no SATA any more, and it's based on a different SoC (quad-core A31s CPU), which makes it incompatible to the A20-based models. As of March 2016 SinoVoip offers a "M2 Plus" version (BPi-M2+). Due to the H3 SoC used and a different form factor it's likely rather incompatible to both M2 and the older (A20-based) models. 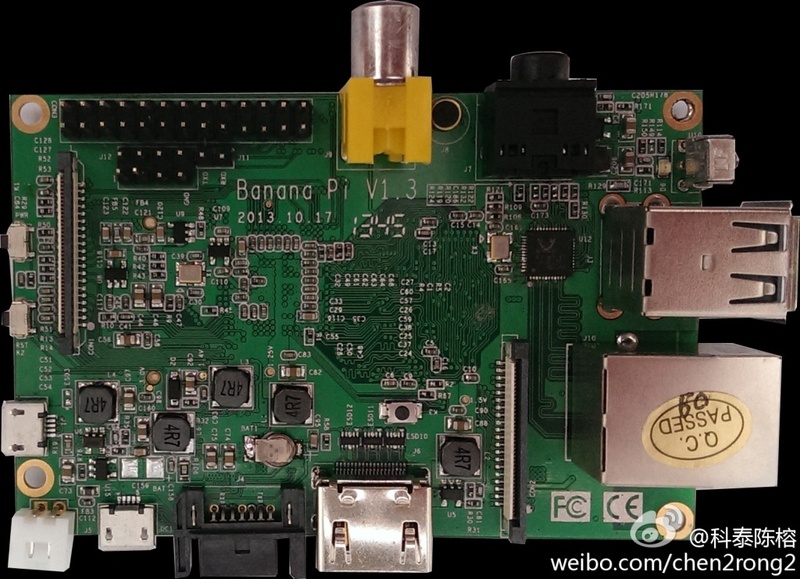 SinoVoip started to sell the so called Banana Pi M3 (BPi-M3) in November 2015. It's based on the octa-core A83T SoC with a PowerVR SGX544MP1 GPU and 2 GiB RAM. It offers microSD, onboard WiFi/BT4.0 (AP6212), GBit Ethernet, 40 pin GPIO, 1 x µ-USB 2.0 OTG, 2 x USB 2.0 host and an ultra-slow GL830 USB-to-SATA bridge behind a FE1.1S hub. Since there's no mainline support for the A83T yet and the OS images SinoVoip provides fail in many regards, situation with the M3 can be considered even more problematic than with the M2 today. Even worse: Since the A83T used on the M3 has only a MIPI interface LCD displays sold for the older Banana Pi variants can not be used any more. As of July 2016 SinoVoip now offers a Banana Pi M64 (BPi-M64) based on the A64. 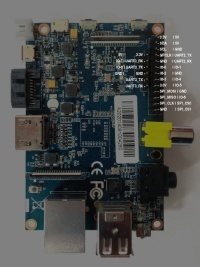 SinoVoip manufactures and sells two other boards labeled "Banana Pi" that are not sunxi-based and totally incompatible with Banana Pi/M1/M1+/Pro: the BPi-D1 has been developed by Lamobo and is sold by them as Lamobo D1. Same applies to the so called BPi-G1 which is also sold as Lamobo G1 in Taiwan. A various amount of prebuilt images is provided via LeMaker's Website. bananapi.com download section for the Banana Pi (BPi-M1). There are several websites about Banana Pi and claiming to support it. It has to be clarified, what is "official" and who is behind these sites (also see introductory remarks). File:A20 Bananapi Schematic.pdf (LeMaker), Banana Pi M1/M1+ schematic (SinoVoip). Lamobo cooperates/cooperated with SinoVoip and provided OS images for Banana Pi/M1, and the router board Lamobo R1. Foxconn Super Pi - Foxconn produced board. This page was last modified on 12 April 2019, at 09:55. This page has been accessed 147,365 times.